Why does it seem that the marriages of so many monarchs are often made in hell? And yet we can’t stop reading about them! 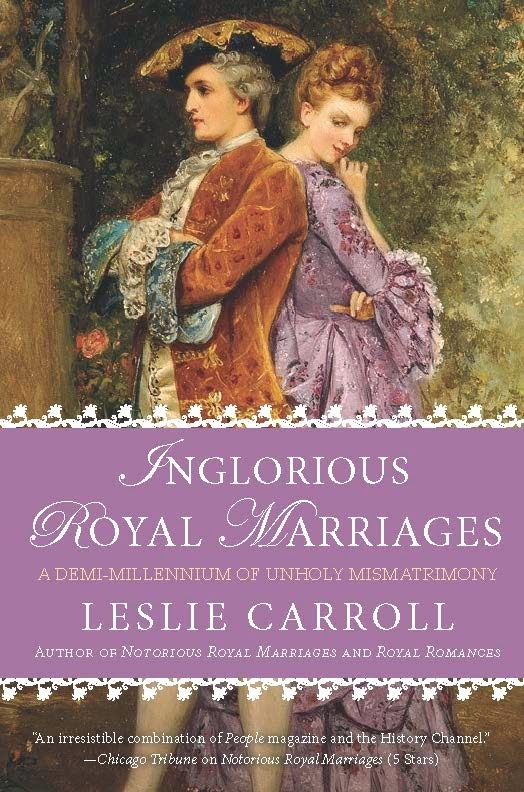 On September 2, INGLORIOUS ROYAL MARRIAGES: A Demi-millennium of Unholy Mismatrimony, will inaugurate the release of my 5th nonfiction "royal" title for NAL and my 20th published book in total. The time has just whizzed by since my first book was published in March 2002! Royals endlessly fascinate me because it’s part and parcel of their official persona to seem so distant and remote, so unlike us at all—and yet of course they have foibles and flaws and failures as well as triumphs. Perhaps we are most intrigued by their missteps, because it does bring them down a bit to our level, even as we aspire to breathe their rarified air. When it comes to royal relationships, I have profiled the good, the bad, and the ugly. And in every book I wrote, the dozens of sovereigns and princesses and dukes and princes—and their lovers and spouses—were selected for inclusion because I empathized with at least one, if not both, of the people in the relationship. Because in the end, it’s not about how many castles one owns. Or thrones. Or gowns or crowns. It’s about the choices one makes. Who one loves. How one copes in times of adversity. It’s the common thread of humanity that shapes my themes as a nonfiction author writing about royal lives. Do you enjoy reading about real-life royalty? If so,why? And, if you're also an author, have any of their lives been featured in your own novels?